Coming off a long winter it’s time to get back in shape. You may be wondering how to scrounge up the energy to get you through your fitness workouts. Well I have the perfect solution: plant based foods. Not only are they jam-packed with nutrients and bio-available vitamins and minerals to fuel your body, but they also taste amazing. Let me remind you that when you work out it causes stress, which creates acidity in the body. In order to regain a state of alkalinity it is essential to neutralize the body by consuming a plant-based diet filled with whole foods. 1. Almonds are rich in magnesium which helps turn sugar into energy. These nuts will also help regulate your protein intake rather than quickly using up your energy. An ounce of these nuts a day will keep you full and loaded with energy. 2. Chia seeds are loaded with fiber and complete protein to raise energy levels. Not only are they gluten and grain free, but also their absorption properties serve as an excellent way to avoid dehydration after a workout. 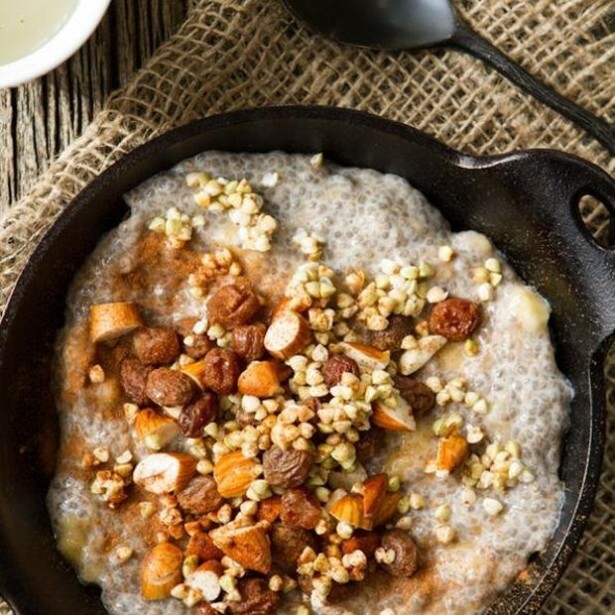 Chia makes the most delicious morning porridge. 3. Cacao is one of nature’s richest sources of magnesium. It gives me a natural boost of energy – the perfect excuse to have chocolate for breakfast. Tossed in a smoothie or a cereal it adds the perfect crunch and kick! 4. Coconut water and coconut oil – Coconut water replenishes the body with much needed electrolytes. Coconut oil is one of the only fats that is directly turned into energy by the body, and helps conserve energy for breaking down other foods. Cook with coconut oil because it is safe at high temperatures, and adds a delicious taste to your food. 5. Sea vegetables store a wide range of trace minerals and nutrients. In addition they provide natural sodium to the diet. 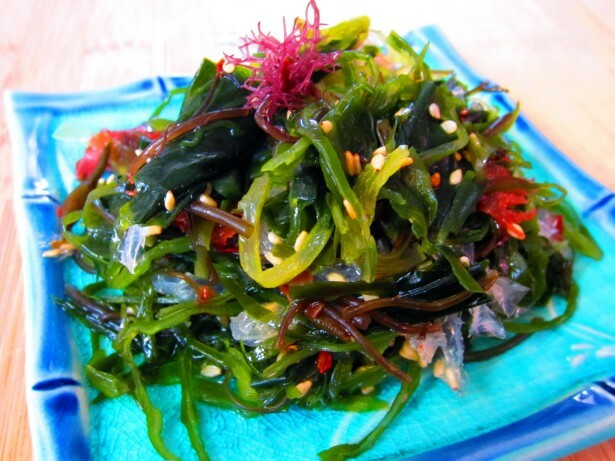 My favourite sea vegetable is arame or nori. It gives me mental clarity and focus. 6. Kale is a powerhouse green leafy veggie. It is loaded with magnesium and is alkaline forming. Chopped up in a raw salad, steamed as a side dish or sprinkled with some sea salt and baked into chips, kale completes any dish. 7. 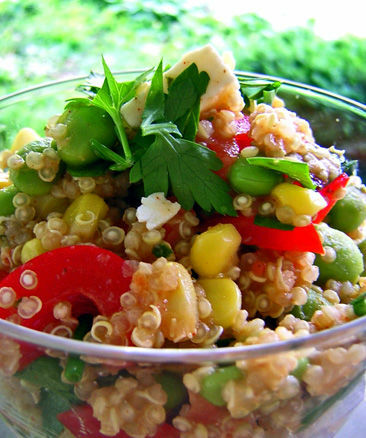 Hemp Seeds contain the perfect ratio of omega-6 to omega- 3 fats. They lead to increased productivity, prolonged energy and decreased stress levels. When hemp is consumed in the form of oil, it is a great vegan alternative to fish oil. Put them on salads, in smoothies and in cereal. 8. Honey, soothing and easy to absorb, is loaded with enzymes and antibacterial and antimicrobial properties. It’s a natural source of sugar and calories and acts as a muscle fuel during exercise. Honey is a great way to replenish your muscles after a workout It serves as a perfect addition to any pre workout snack. 10 . Tempeh is fermented, easy to digest, delicious and one of the highest sources of plant protein. Marinate tempeh with cider vinegar, lemon juice and coconut oil for a boost to my salads and wraps.favourite sea vegetable is arame or nori. It gives me mental clarity and focus.